With a postgraduate diploma in management studies from the Indian Institute of Management, Ahmedabad (IIM-A), Bhushan Punani, now 64, had the world at his feet. But unlike most other MBA grads, Punani’s dream did not come wrapped in a business suit. He looked at his academic qualifications—he also had a postgraduate degree in dairy science—as a ticket to empowering visually challenged individuals in ways that had not been done before. Starting out as project manager and working his way up to executive director at Ahmedabad-based Blind People’s Association (BPA), this change-maker has helped the institute evolve into one that now works with individuals with all types of disabilities through 16 campuses across the country. When Punani signed up with BPA in 1979, the institute was still finding its feet. Today, its services include providing employment and offering industrial training courses, skill development courses, health services and support services via assistive devices and counselling. After he graduated from IIM-A, Punani was still contemplating the path he would take when destiny interrupted these musings. He received a visit from Manubhai Shah, a visiting faculty member at IIM-A, who offered him a job at the then fledgling BPA. It was a decidedly unconventional choice for someone with academic colours such as his but Punani was resolute in his decision. Thus, in September 1979, he officially joined the organisation. “The job was both challenging and exciting as we had about 300 beneficiaries at the time with a school for the blind, a workshop and a vocational training centre. Funds came from the government and donations from people.” The philanthropy of the people of Gujarat considerably helped Punani achieve his goals. This was especially refreshing since the disability sector was still new and unexplored territory in the NGO domain. 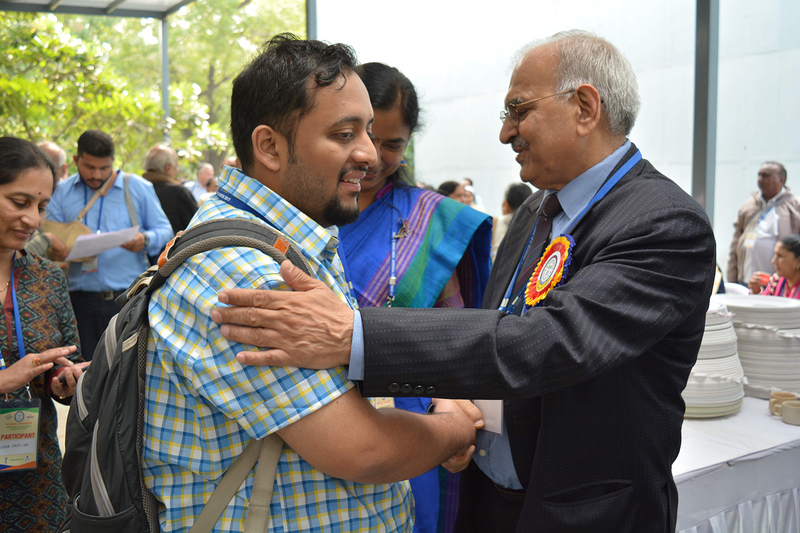 Punani reached out to people in the community with projects for the blind, the deaf, and persons with multiple disabilities, pitching the concept of ‘Community Based Rehabilitation’ (CBR). “We started our first project in 1982, in Dholka, Gujarat, and the next in Chikmaglur in Karanataka. Under CBR, we would identify a local partner that could be a rural development agency in the area. It would then work as the implementing agency. The local agency identifies persons with disabilities and works for their rehabilitation by empowering them through schemes for training and micro-credit. We provide funds for the first three years and also train the local field workers and supervisors for the purpose,” explains Punani, now executive secretary of BPA. Over the years, BPA expanded to include a physiotherapy college for the disabled; starting an industrial training institute that offered courses in data preparation and computer programming, offset printing, etc; and establishing the Gatorbhai Himmatlal Patel Orthopaedic and General Hospital and the Navalbhai and Hiraba Porecha Eye and ENT Hospital in Bareja, Gujarat, a rehabilitation centre for the mentally challenged in Jodhpur, Gujarat, RM Parikh Resource Centre in Paldi, Gujarat, and two schools for disabled children in Ahmedabad. “The type of wealth I generate cannot be measured in terms of money. We develop skills, educate and give opportunities to the disabled. 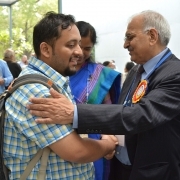 I have been paid in smiles by my beneficiaries and have helped give their lives new meaning, filled with hope and expectation.” This is what Punani said when he was invited to speak on ‘wealth generation’ at his alma mater, IIM-Ahmedabad, where he shared the dais with the presidents and CEOs of leading corporate houses. His mission goes well beyond the institution he has nurtured and helmed for the past four decades. Considering his colossal body of work, he was appointed a member of the Steering Committee, among other committees, of the 12th Planning Commission, as an NGO representative of the Western Group. He was also appointed member of the Drafting Committee for the Rights of Persons with Disabilities Act, 2016, for which he has drafted chapters on education and rehabilitation. The new legislation is in consonance with the provisions of the United Nations Convention for the Right of Persons with Disabilities. It provides for the promotion of a barrier-free environment and accessibility to education, training, employment and support services for all persons with disability. Punani believes in a hands-on approach to creating awareness about visually challenged individuals. He signed on an Italian architect to create Vision in the Dark, a space where sighted people perform simple, everyday tasks in pitch darkness. Located on BPA’s Ahmedabad campus, the only way a sighted individual can navigate this world of the blind is by being guided by a visually challenged person. The idea is to get a sense of what one’s world would be like without sight. Apart from sensitising people to the challenges that the blind face on a daily basis, the project also seeks to influence designers, architects and engineers in designing inclusive spaces while keeping the differently abled in mind. Under Punani’s leadership, BPA has also launched an assistive technology museum within its Ahmedabad premises, which is thematically linked to the Vision in the Dark exhibition and displays 70-odd exhibits that help the blind experience what the sighted can. For example, there is a printer that can enlarge the written word and images, and a scanner that can read a book in audio form. The assistive technology aids displayed here also include a wrist watch, calculator and medical aids like a blood pressure monitor designed with the visually impaired in mind. What misconceptions do people at large have about the differently abled? There are several. In the first place, people take it for granted that they cannot grow like normal human beings, that they cannot make progress. Sadly, people look at the blind and other disabled people as objects of pity and charity. People treat them as people in whom they should not invest money. And if they donate money for them, they feel it will bring peace to the souls of their deceased relatives. This is lamentable. What can we do to correct these perceptions? This can be done through projecting the success stories of the disabled in the mass media. This can change the attitude of people towards the disabled. The media can have tremendous impact on the minds of people if they bring to light the struggles and achievements of the disabled. People should develop a positive attitude towards the disabled considering they can also live a meaningful life. What can the man in the street do to appreciate the strength of the differently abled? A. If they come to our organisation, they will realise what the blind and other disabled people are made of. They would see a physiotherapist, a computer-literate young man, and a painter busy making brushstrokes; and, to one’s surprise, they are all disabled. The Blind People’s Association (BPA) would like to have volunteers who can work as catalysts for change that would convey the message that the disabled should not remain confined to homes. The common man needs to be aware of the strengths of the disabled, and he doesn’t have to spend a rupee to raise that awareness. What about the role of the parents of the differently abled? Parents of disabled people should know that their sons and daughters are also human beings and should not confine them to homes. They should realise that they are not a burden to the family as they too can study, make progress, be productive and contribute to growth. Did you find gender discrimination in the families of the differently abled? As ours is a patriarchal society, it is there. But things are slowly changing. Thinking individuals should support equality among such siblings through educating the parents. Activists too can help. What about the role of the Government? Ours is a welfare state and the Directive Principles in the Constitution are there exactly for this reason, ‘for caring of the marginalised people, poor people and protecting their rights’. The Government is duty bound. Many governments do it but sadly there is a lack of consistency. When an officer is transferred or retires, the project often suffers. There is no sense of ownership among government officials and there is lack of accountability. The truth is, the beneficiaries do not carry the weight of a vote bank. In our case, though, the Gujarat government has supported BPA over the years. The people of Gujarat are also very philanthropic. There is an element of humanity in them and they have supported us throughout. What kind of world do you envision for the differently abled? I want a world for them in which they have the dignity of a human being, have equal rights and opportunities, and are given the respect is due to them. People should feel it is their world also and that they are not lesser beings.